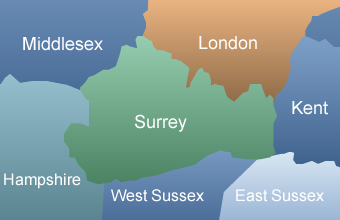 The Homefront Roofline Ltd of Surrey, specialists in the repair and installation of UPVC Fascia Boards. Why choose UPVC Fascia Boards? 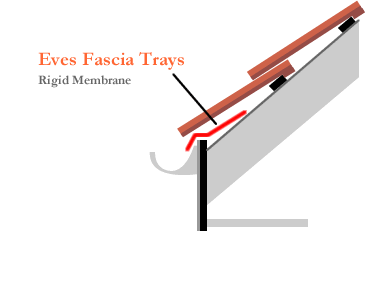 What are fascia boards and what do they do? 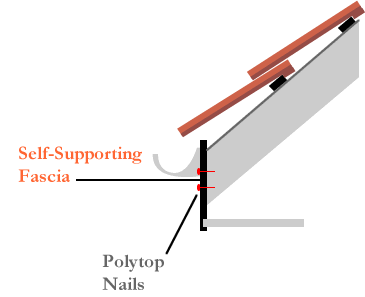 Fascia boards have two roles. First they cap the feet of the roofing rafters preventing birds, vermin and insects from entering the loft space. 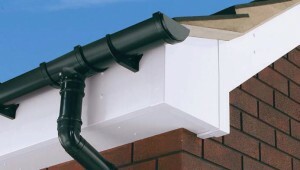 They are also load bearing structures that support the rainwater system and soffits. 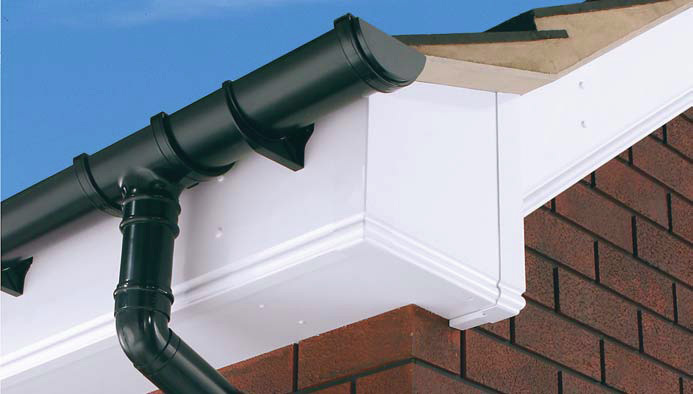 Self-supporting fascias are strong-thick UPVC boards that are joined to the feet of the rafters with polytop nails. Self-supporting fascia boards are a good solution on new build properties where the rafters are healthy and strong. 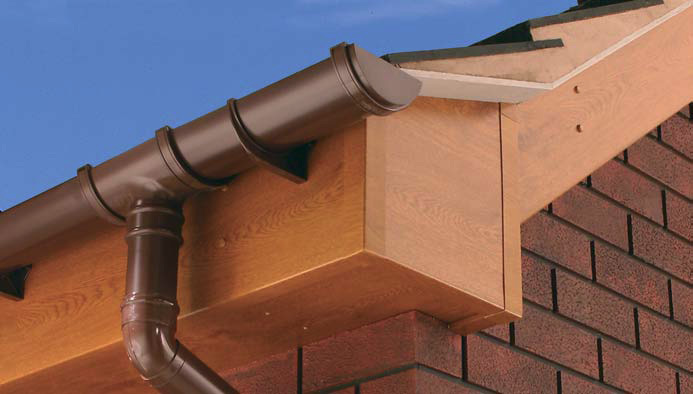 Timber backed fascias are usually preferred on older properties. This is because more fixings are generally required on older rafters and with a timber-backed system we can hide these behind the UPVC fascia to deliver a more attractive finish. 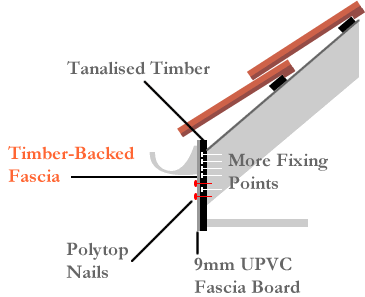 Timber backed fascia systems have two layers. First, lengths of tanalised (treated) timber are attached to the rafter feet. This provides a strong load-bearing platform for the soffits and rainwater system. Next the tanalised timber is clad with a 9mm UPVC fascia board. Timber backed systems allow more fixings to be attached to the load-bearing rafter feet. The fixings are then concealed by the UPVC fascia. Tanalised timber is very durable. It typically has a guaranteed of 20 years and is expected to last 70+ years. If a property has sound roofline timbers then over-cladding can be a cost-effective alternative to repainting. The over-cladding process is similar to the timber-backed process described above. However, the existing timbers are not removed. Instead, they are covered with a 9mm UPVC fascia board. In practice, over-cladding is rarely used and in 99% of our projects we remove the existing timbers and install new ones. NB: We advise caution if considering an over-clad solution. What are decorative fascia profiles? Fascias boards can have different finishes on the bottom edge. There are three general types; bull-nose, square and ogee. The finishes are purely decorative and do not affect the function of the board. Bull Nose and Square profiles offer a maintenance-free durable solution. Ogee profiles can trap dust and dirt in the groove and might need periodic cleaning. Bull-nose fascias are rounded at the bottom. 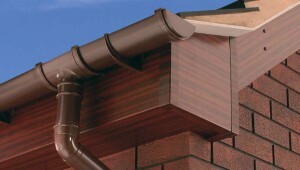 Ogee fascias have an ornate finish at the bottom. What are eves protection systems? 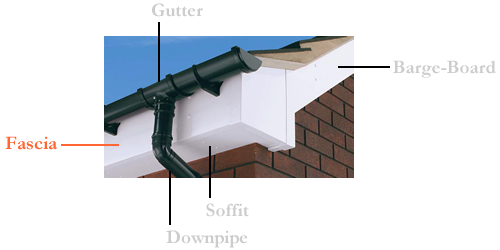 When installing new fascias it is important to protect the eves of your house from rain that is blown up under the guttering. For this reason we install an Eves Protection System. There are generally two types. Eves Fascia Trays are suited to homes with large interlocking concrete tiles. Hyload Damp Membranes are used in housing damp-proofing systems and are very durable. 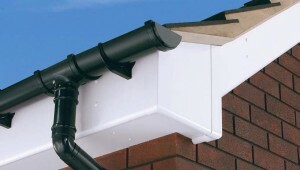 Hyload Damp Membranes are suited to homes with small traditional plain tiles. 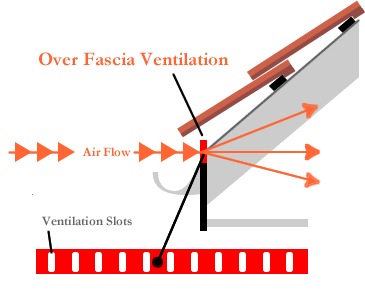 What is over fascia ventilation? Ventilation of your roof-space is very important. Your loft-space could become damp and your roof timbers will rot if not ventilated properly. 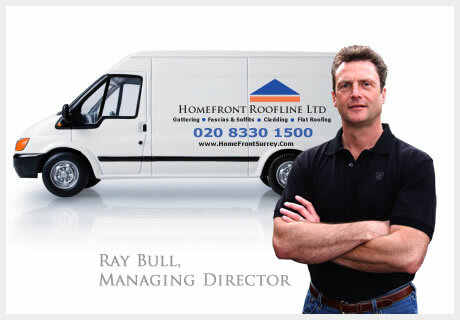 There are two roofline systems that can be employed to ventilate your roof-space. The first is known as a Hidden Over Fascia Ventilation system and the second is known as a Soffit Ventilation Grill. 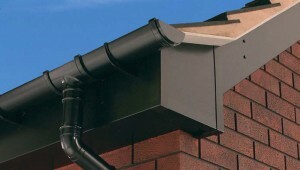 In this section we will consider the Hidden Over Fascia Ventilation system. Soffit Ventilation Grills are considered in the Soffits section of our website. Hidden Over Fascia Ventilation grills come in 1m lengths and are approximately 25mm (1-inch) tall. They offer a continuous bank of slots that allow air to travel through and into the roof-space. What are foiled roofline products? You might be interested to learn that coloured UPVC fascias, soffits, cladding and barge-boards are actually manufactured in white and are then modified with a laminated layer of coloured foil to create the new colour or finish. The lamination process is carried out in the factory and is transparent to the client and installer. However, if you gouge off a section of scrap material with a very sharp woodworking chisel you can discover the original white UPVC board underneath. The reason the manufacturer uses this process is that it improves the heat expansion characteristics of the board (white expands less than dark colours) and eliminates the chances of distortion or rippling. The foil is very strong and we have never experienced any delaminating in service. Need a quote or want to know more? Request samples, ask advice or arrange a free no-obligation quotation.